In this note we suggest you to review your direct feedback settings to take full advantage of this powerful marketing tool, which goes beyond service control or being a mere proponent of online reputation. We should not confuse management of “direct feedback” (proactive management of opinions) with the “online reputation” management (reactive management of opinions). It is true that the latter, derived from the phenomenon of aggregation of opinions in comparators and OTAs, has taken in the last years the focus attention as a result of the perfect storm created by: a very atomized hotel industry, a prescriptor that saw the opportunity and developed the business concept flawlessly and successfully, and those who stepped up to the wave and also saw the opportunity to create a need for reputation control as if there were no tomorrow. This created a crazy flight forward movement where hotels are pushed to continuously publish comments and respond to comments “non-stop”:, like in the Pollack film “They Shoot Horses, Don’t They?”, situation forces dancers to never stop dancing. But let us return to direct feedback, since it is the genesis of online reputation (it defines what is going to happen in social networks and user generated content sites), and is the basis of the future link for recommendation and referencing. Here we propose to fine tune direct feedback. The first thing is to ask how our business stands in terms of customer identification. We do not refer to the name and surname, passport, room or credit card. We refer to the electronic identification, that is, the data that allows you to communicate when you think it’s convenient and with a complete reach of “ALL your customers.” The reception of the hotel is an irreplaceable point of attention (although now we read that in the future they will disappear, we do not believe it …), but it has a limited capacity “per se”, as an instrument of communication. We believe that this case is a representative example of the reality of an independent urban hotel. 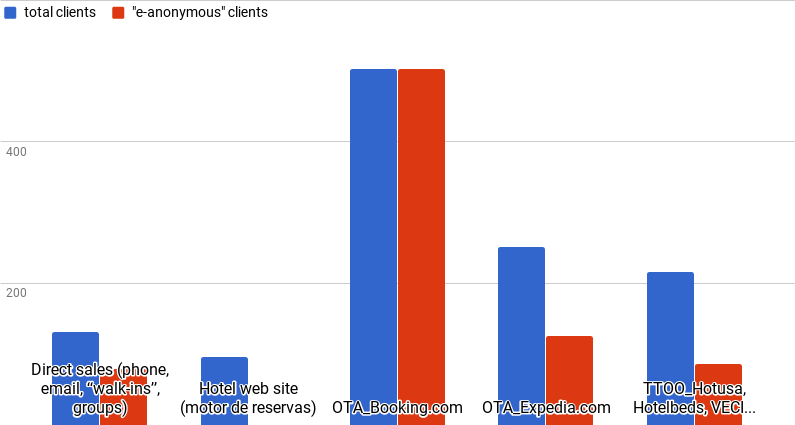 Eighty percent of customers are e-anonymous (they do not have data for the hotel to communicate electronically with them). Fixing this issue is one of the “pillars of customer intelligence”, determines the height of the bar that the hotel can set. If the e-anonymous number is LESS than 40%, congratulations! There is improvement area, but it is a question of adjusting and refining the system. Probably what we discuss below gives you some clues to check. Internal operations. It is the most complicated, but the most relevant. Although it seems to be patently obvious and very philosophical, team awareness about the value of customer data for the business is fundamental. In the reception process, the best is to have a protocol in which if you do not have the email at the time of check-in, a fire alarm is activated to alert the receptionist; If you think it is a little too much, simply encourage the request of customer data and justify it by the subsequent sending of useful destination information, or simply with the argument of keeping the communication channel open. In the commercial operation it is convenient to review the agreements with OTA’s, where there are different formulas according to the channel. There are OTA’s that provide customer data but temporarily and “intervened”, others give the data according to the form of payment contracted, or just do not give any data at all :(. Dialogue between systems. As in any business several management systems make the wheel turn, and each in its discipline. PMS is the heart, but there are others that are also vital to stay alive day by day. The booking engine and channel manager are important “providers” of customer profile data that can also provide the communications / CRM system with the data needed to program and automate communications. Clearly the most efficient route for communicating data is a somewhat technical review, but it’s worth it. If you already know your index of identified clients , there is always possibility of adjustment!, here we give you some reflections. In the message, let’s look at the first thing your customers see: the sender and the subject of your communication. Your email address must be corporate and not promotional. We recommend not to ship from accounts that look generic like info@ or yourhotel@. Use accounts such as customercare@ or similar, which sound more personalized. The sender to be shown is an opportunity to identify quickly; Simply the name of the hotel, we think is the most appropriate. The subject should definitely motivate. A subject like “quality survey” will not be appealing; You want the customer to give an opinion, , not to fill out a questionnaire. The style of question with the question “How was your stay in our hotel?”, “Thank you for your stay, was everything OK?”, Are effective: it is clear and concrete. Better if you precede this question with the customer´sname; provides closeness, recognition, and we all like to hear / read our own name. When evaluating the service we can show other questions on another page of the browser, we discuss this later. Make sure that you are covering 80% of your clients with a language configuration appropriate to your mix of nationalities, and that in case of unknown the nationality you will propose English language (recommended). You should be in a response rate of between 20 and 30% (over communications sent), it is a ratio to which you should aspire. When to send the communication? If you do not do it during the stay, the day before departure or during the checkout (very interesting options since the feedback is received whenthe customer is still in the hotel and there is an opportunity to react), our recommendation is that you program it to be sent immediately after departure. Something that can happen is that your emails are going to spam. This can happen if there are words like “free” or “offer” in the mail or in the subject, or a very high proportion of images over text. It can also happen if you do not have the SMTP protocol enabled (an internet standard for the transmission of emails) that we recommend activating. There are many communications that your client receives, and in addition, you will probably enter into “competition” with the OTA or TTOO, but you do not have to become complacent or suffer for the emails that your client receives; He knows how to manage his inbox, and if you have cared for him, he will surely consider it relevant and will compensate you with his opinion. Do not discard sending your communications to client emails redirected by OTAs.ur experience tells us that the legitimate communications you make to your clients arrive, and these become, sooner rather than later, in direct communications. The temptation to wanting to know everything, and therefore to ask too many questions, is too strong, but one must resist; That is the first sign of the appreciation you feel for the customer. We recommend that you put the limit on 10 questions, not only because your response rate would fall seriously and the final effect would be detrimental, but because it is currently not politically correct to propose neverending questionnaires that harm your image. If you do not know where to cut, apply “rate of appearance” that will alternate questions with the percentage of appearance you assign to each question, applying a higher index to the questions that most interest you, and that will therefore appear more often. Keep in mind the different devices from where your customers are responding. More and more, the messages are open from mobile devices (according to our data, the share of mobile is approaching 50%), and in these devices, the size of the form is capital. Reduce even more your selected questions, and define what aspects you want to be evaluated, on mobile we recommend no more than 4 or 5 questions. Remember that web forms are something alive, such as your business, and changes in your services, your focus in improvement measures, or having implemented new services must also be reflected in what you ask to the customer. It is frequent the association between direct feedback with the “customer satisfaction survey” once the hosting service is provided; But direct feedback can be much more. It may be OK in your business to collect opinions about a particular service, immediately after you have rendered it. Multipurpose web forms: pre-check in, special requests, restaurant, entertainment service, registration to a promo, or the employee (frequently forgotten …) give you a variety of opportunities to collect data / structured information in an agile and very efficient way. Likewise, try to make the web form very clear and concise with short questions and ensuring that the wording makes clear what the client evaluates. Remember, the NPS (Net Promoter Score) gives you a very revealing index, the% of customers who would recommend your brand for the aspect they evaluate. But, with all this, do not just stay in the index…, that would be like wasting the power of this method. The direct feedback based on the NPS is more a relationship and linkage system that you create with your client, than a monitoring index. The NPS will identify who can do marketing for your business, is not it fabulous? What did you think of our restaurant? Show your clients that you do not propose yet another web form any more, and activate the functionality of concatenating question intelligently (suggest another question based on the answer). It will give you qualitative information and give you a better image, as it will become a really dynamic experience and will motivate the customer to continue. The confirmation page page. It is presented to the customer once the push button is pressed. Thank you message after receiving customer feedback. Once you receive the customer response alert (especially important for less satisfied customers). Hello [* name *], really, thank you very much for your comments! Experiences like yours are very interesting to know in detail to solve it and give you an adequate response. If you do not mind, a person from our team will contact you to know more in detail. Hotel address Hello [* name *], thank you very much for your answer. It seems that there are things that we must improve for your next stay. We take good note of your ratings and hope to see you again soon. Hotel address Hello [* name *], thank you very much for your comments; You made the day! We only ask you 30 seconds more to share your experience and so your friends can discover our hotel. * They are categories with recommended indexes, but the interpretation of what you consider neutral, negative or positive you can adjust to your criteria. In the case of promoters, this moment is the most appropriate to invite them to share, and here comes the decision of which social network or comparator to propose. It is not a big decision like marriage: , you can try for two or three months, a social network like Facebook and thereafter propose the reviews widget from Tripadvisor. This way you can check its effect and decide which one is the most interesting for your business. In the cases of passive clients and detractors, subsequent communication, once you have received the alert of the customer’s response, is important for the engagement with them. This is the fastest and most direct method for converting passive clients into promoters. VERY IMPORTANT: in your answers do not do “copy/paste”; We know that this statement is not that we are going “fashionable”, or even we may be throwing stones against our roof … (programming and automation of communications), but we are convinced: this step should not be treated completely ” Canned “. 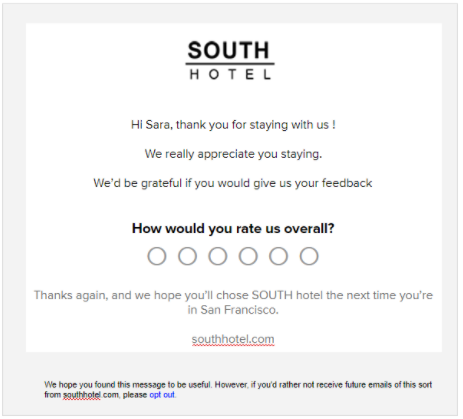 If you are already comfortable with the use of templates to respond, at least use its name (remember, with [TAGS] in the database), and include something, however small, to show that you have read your opinion And that your time invested in responding to your hotel appreciate it. And remember, direct feedback is predictive, unlike reputation management, which is reactive. The interpretation of customer feedback: is an early indicator of what you are going to read about your business at the same time as the rest of the world. If you work on direct feedback, you are controlling your future public reputation. Promoters are usually less sensitive to price than other customers, as they think they get a good value from your hotel. On the contrary, detractors tend to be more price sensitive. At the same time, promoters tend to spend more and more often. In your proposals for subsequent communications this will be the segment that will respond better and share more. The detractors are the ones you have to fear from a reputation point of view. Your retention, reputation and referencing rate depends on how you manage this segment.